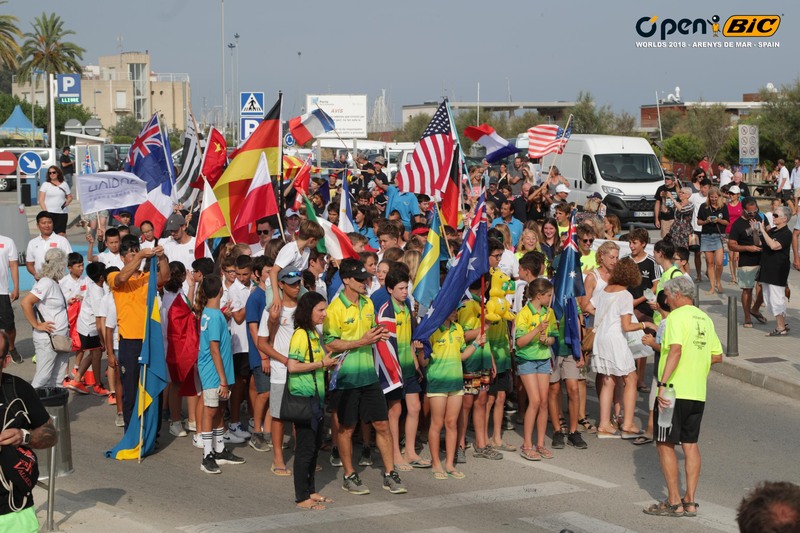 A lot of smiling faces in Arenys de Mar, Spain as the Open Bic World Championships come to a start. 184 competitors have entered the event and are hoping for a little more wind than we had at the EuroChallenge, which was held just prior. In the EuroChallenge it was the French team in all the top spots of the U17 category Marin Micoulot was first followed by Leo Piroird and Lana Belhout. In the U13 it was Australian Breanne Wadley ahead of Max Cheli from Grance and Ted Houry from New Zealand. The Eurochallenge was however just a warmup, as everybody is looking for that ultimate prize of becoming World Champion. A parade with drums crossing through town was something to watch yesterday evening and at the opening ceremony you could just tell the kids were really excited to start the regatta. The first possible warning signal is at 13:00, but no wind yet. So stay tuned and follow our updates.